It is 11:20 am on the morning of August 29th when A. J. Wanderlust motors out of slip J-9, down the fairway and past the breakwater. Her destination is Poulsbo, approximately 30 miles away. The weather of Puget Sound is benign today, with a north breeze of 3 knots and calm seas. Multiple sea lions are perched atop the safe water mark. I spin A. J. Wanderlust around the buoy to photograph the barking creatures. Jackson puts his paws on the cockpit seat for closer examination, but recognizing the now familiar creatures, yawns and returns to his slumber. We motor A. J. Wanderlust across to Port Madison. Traffic is heavy in Puget Sound as two tugs with barges, a China Shipping Lines container ship and many sailboats with no wind in their sails zigzag the waterway. It is a smooth transit into Agate Pass. The wind now blows from the southeast at 6 knots. The seas are calm except for being rippled by tide. A. J. Wanderlust passes the Keyport torpedo testing and development buildings, large white edifices that contrast sharply to the surrounding natural landscape. Rigid hulled vessels about twelve feet in length race around staged buoys off Keyport at astronomical speeds. The vessels are powered with massive horsepower engines; the solitary driver wears a helmet in case of crash. The sun finally emerges through the clouds as A. J. Wanderlust reaches Liberty Bay. Backing down on the anchor, I feel a strong tug, peace of mind that the anchor is well set in thick, sticky mud. Poulsbo, a small Washington town with Norwegian heritage, is located on the Kitsap Peninsula almost due west of Ballard. Blessed with an expansive and protected harbor that shallows past the marina breakwater, Poulsbo can accommodate a great many pleasure boats. A skipper can be assured of a good night�s sleep while at anchor given the thick and sticky mud bottom which holds well a properly set anchor. Main Street Poulsbo boasts a quaint character with numerous small, eclectic art shops and an excellent bakery in the Nordic style. Fanciful murals adorn the building facades and an abundant supply of restaurants can be located featuring diverse cuisines, including German and Italian. An excellent wood fired pizza house and a brilliant nautical charm store complete the main street landscape. A pleasant town to wander about, the visitor can also meander the boardwalk to the pretty regional park. Small town atmosphere and quiet stillness are the predominant features of a Poulsbo visit. Once at anchor, Jackson is anxious to get ashore. He loves walking the shady streets of Poulsbo, knowing that frequent rest is assured as Mom window shops. Jackson also knows that Denny will want to visit the bakery, bringing both humans and canine a tasty treat. Liberty Bay Park provides a shade refuge for walking as the sun brightens too much for my Bernese. Denny and I go to �The Loft� restaurant for a late Saturday lunch. Jackson�s dinner on both Saturday and Sunday consists of a generous slice of pepperoni pizza from the wood fire pizza restaurant. Again, the weekend comes to a close far too quickly. I am still unaccustomed to being a weekend sailor, unaccustomed to bringing A. J. Wanderlust back to a familiar marina. A part of me continues to long for extended passages and the challenges of open water sailing. I know that A. J. Wanderlust must be repaired and the cruising kitty filled before I embark on another extended journey, but still my wanderlust burns strong for new adventures. Today, the wanderlust will have to be satisfied by a small new challenge. Seeing bright sunshine and Mount Rainer�s snow capped peak visible across Liberty Bay, I decide to take the long way home and circumnavigate Bainbridge Island. A. J. Wanderlust passes Battle Point to starboard and leaves Brownville to port, soon A. J. Wanderlust motors around Point Glover to enter Rich Passage. Beautiful, crystal clear views to downtown Seattle and Mount Rainer emerge as I exit Rich Pass and motor past the red number 2 buoy that marks Decatur Reef. A. J. Wanderlust rounds West Point buoy off the water treatment plant; I see tarps surrounding the lighthouse under restoration. Dusk is settling over the sky as A. J. Wanderlust enters the south entrance of Shilshole Bay marina. Sea Lions haul out atop the safe water mark buoy for a rest. 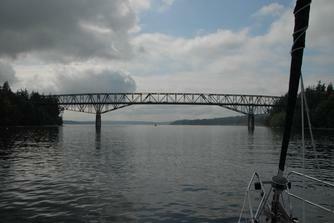 Agate Pass Bridge joins Bainbridge Island to the Kitsap Peninsula. 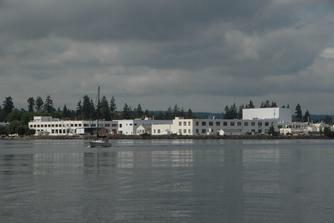 Keyport Naval Research and Testing Facility located along Agate Pass. 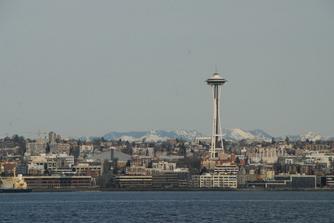 The snow capped Olympic Mountain range backdrops the buildings of downtown Seattle and its famous Space Needle.